The over 1000 people (many of whom hail from S. Korea) who have downloaded “Gobblet” to their Android smartphones over the past year would never guess that this addictive computer game was born and bred in a Boys Town Jerusalem laboratory. Matan Issler, 19, developed the sophisticated online version of the board game as a student in the new Software Engineering division of BTJ’s College of Applied Engineering. 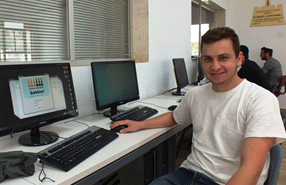 As an integral part of the syllabus, Matan and his classmates have applied their knowledge of math, algebra, statistics and computer science to the practical challenge of creating computer games. Matan Issler took the already-complex assignment one step further when he developed an app for “Gobblet” for smartphone use and uploaded it to the Android Play Store. Those who have downloaded the free game, which develops memory and strategy, are offered the choice to play against friends or against their smartphone. (For his enterprising venture, Matan profits from Google ads on the site.) Although Gobblet has existed since 2001, albeit in a box with plastic pieces, transforming the game to a smartphone game demanded highly advanced technological skills. Matan notes that while his is not the first Gobblet app, his version is far more sophisticated than the existing one. Matan and his classmates recently gained the distinction of becoming the first Software Engineering majors to graduate from BTJ’s College of Applied Engineering. Within the coming weeks, they will enlist in the IDF for five years of active duty to serve as officers in crack IDF Cyber units in the Intelligence Corps, advanced computer programming units, computer support teams, and other critical posts. “Our leading-edge studies give students a winning start in the game of life,” said Boys Town Jerusalem Dean of Students Rabbi Meir Linchner. To try your hand at Gobblet, go to the Play Store on your Android phone and search for Gobblet. Once you find the free app, click “Install” and get ready to play!